Just across the Guanabara Bay, Niterói offers way more than a stunning view to Corcovado and the Sugar Loaf, including an eventful student's nightlife, trails explored by Charles Darwin and a traditional "roda de samba" in a former slave's refuge. RIO DE JANEIRO, BRAZIL – Cariocas would never admit it, but the city of Niterói has a lot going on when it comes to culture and entertainment. Situated on the other side of the Guanabara Bay, Rio’s neighbor city is undoubtedly worth the visit. 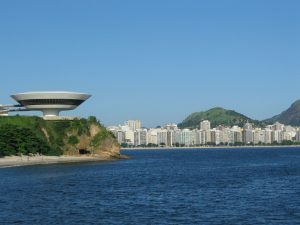 One of Niterói’s landmarks, the Museum of Contemporary Art, designed by Oscar Niemeyer, is famous for its flying saucer shape, photo Wikimedia Creative Commons Licence. Only twenty minutes away from Rio through a beautiful catamaran ferry trip, Niterói is an eventful destination that will certainly make you want to go back. Little people know it, but Niterói is the third most important city in Rio’s state in terms of tourism, only behind Rio itself and Búzios. Niterói attracts tourists mainly for its crystalline oceanic beaches and the Museum of Contemporary Art, famous for its futurist architecture, designed by Oscar Niemeyer. Even though one cannot miss the oceanic beaches and the museum, there is much more to see in the “other side of the puddle” (as Cariocas like to joke, referring to the Guanabara Bay). Situated in the border between Niterói and the municipality of Maricá is Rio’s State Park of the Mountain Range of Tiririca. The unit of natural conservation is famous for having hosted the English scientist Charles Darwin in 1832, who described the green area as “an exuberance never seen before”. Later, Tiririca Park created a path called “Os Caminhos de Darwin” (Darwin’s Ways). Today, the 2,2 kilometer path is used by cyclists and pedestrians who want to go for a nice walk in the nature. The Park opens everyday, from 8AM to 6PM. Those who can’t get enough of Museum of Contemporary Art’s insane architecture must definitely check the other buildings designed by Niemeyer, like Niterói’s Popular Theater, the Juscelino Kubitschek square, the Oscar Niemeyer Foundation, Roberto Silveira’s Memorial, the Reserva Cultural de Cinema’s movie theater, among others. From the Charitas ferry station, in Niterói’s downtown, it is easy to get to most of these venues. If you just want a nice area to chill, read a book or have some picnic with friends, the Campo de São Bento park is the perfect place to go. Situated in the upper middle class neighborhood of Icaraí, the 36,000 square-meter green area seems to have been inspired in an English romanticism’s novel. There, it is not rare to bump into music shows, performances, outdoor film exhibitions and book releases, specially during the weekends. In the catamaran ferry trip from Rio to Niterói, one can enjoy a beautiful view of the Corcovado and the Sugar Loaf, photo internet recreation. In Niterói, one can also find excellent spots for experiencing traditional Brazilian culture. One of the coolest “roda de samba” happens at Candongueiro, a cultural center situated in the neighborhood of Pendotiba. Famous for its relaxed and intimate atmosphere, Candongueiro’s “roda de samba” happens every two Saturdays of the month. Greats like Nelson Sargento, Dona Ivone Lara, Moacyr Luz and Arlindo Cruz are some who have already played in the venue. What’s more, it is possible to have the most delicious feijoada and see a traditional “roda de samba” at Quilombo do Grotão, a former refugee slaves’ community founded in the 1920s. To get to know their next events, you can follow the cultural agenda on their Facebook page. Niterói is also known for having one of the best public universities of Rio’s state, the Fluminense Federal University (UFF). With several campuses spread all over the city, there is no wonder why Niterói presents an eventful student nightlife. Thursday evening is the best moment to feel the student nightlife’s energy, when a bunch of undergrads and masters’ students go to Cantareira’s square, in Niterói’s downtown. Cheap bars, crowded sidewalks and acoustic live music are part of the scenario. 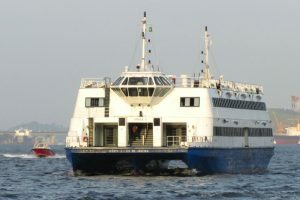 To get to Niterói, take the Rio-Charitas catamaran ferry from Praça XV in Rio’s Centro to the far side of Guanabara Bay. Several bus lines are also available from Rio to Niterói. The more modern, air conditioned ‘1001’ buses (761D, 751D and 741D) make stops all over Rio.